The SiS Rego 500g Protein Recovery drink is ideal for any athlete that is looking to rebuild and support their body's adaptation to training. When you are in a training programme & need your body to adapt to increasing demands, the SIS Rego is perfect. 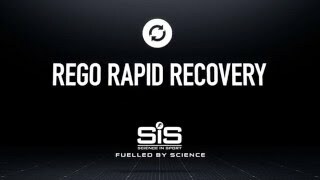 With rapidly absorbing protein, carbohydrate for energy, electrolytes to aid hydration, and maltodextrin to quickly replace muscle glycogen, the SiS Rego range ensures your recovery clock gets wound back more quickly and efficiently than ever, so you'll be at the top of your game today and back on it again tomorrow. Containing 20% protein, drinking one serving after your exercise and one later that day is recommended. Easily digestible, make sure you get the most out of your training with Rego Recovery, with a choice of popular flavours.